I recent took delivery of a large box of models from Tablescape. 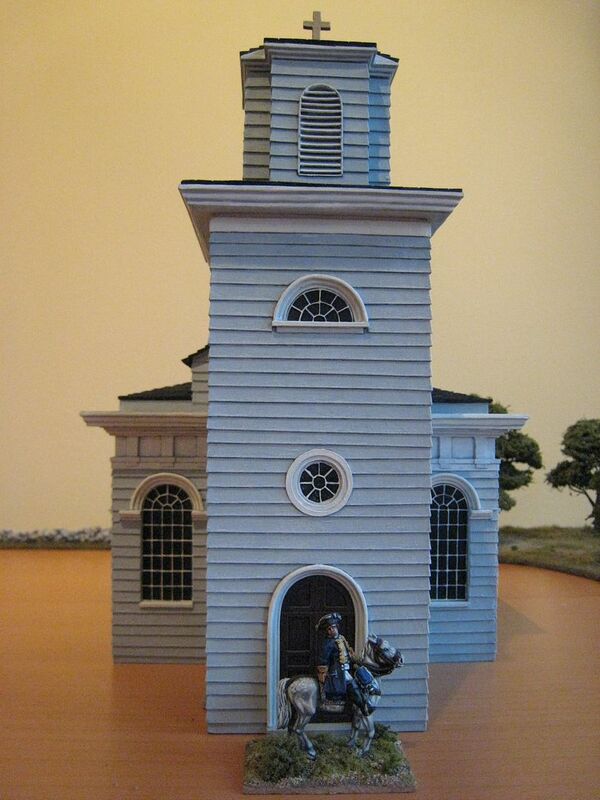 This is the main item - a model of Christ Church in Cambridge, Massachusetts, located on Cambridge Common just down the road from Harvard University. 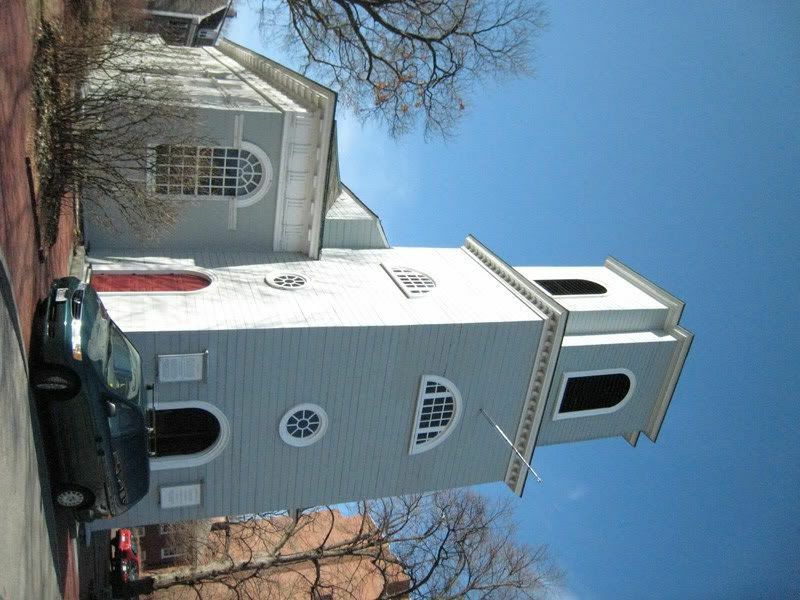 I visited this church during my trip to Boston and South Carolina in March 2008. 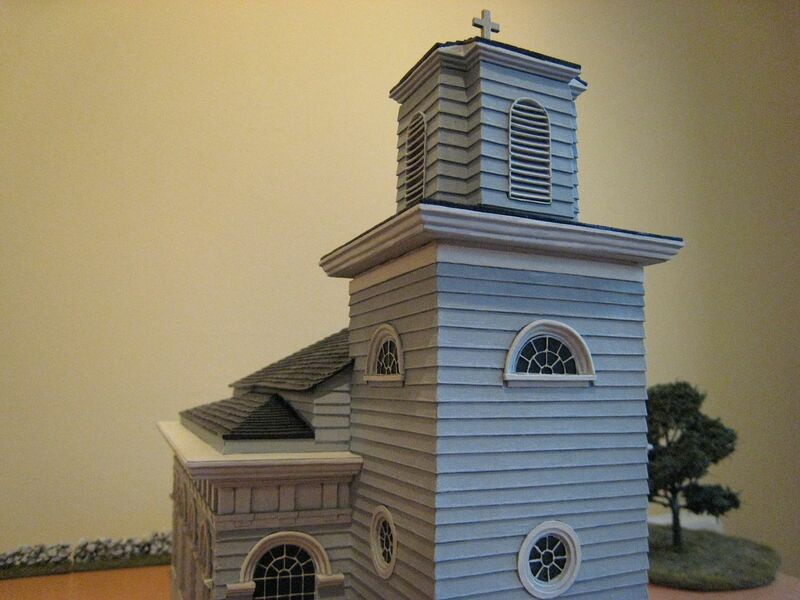 Having taken plenty of photos of it I thought it would make a good basis for a church model to add to my collection of buildings. 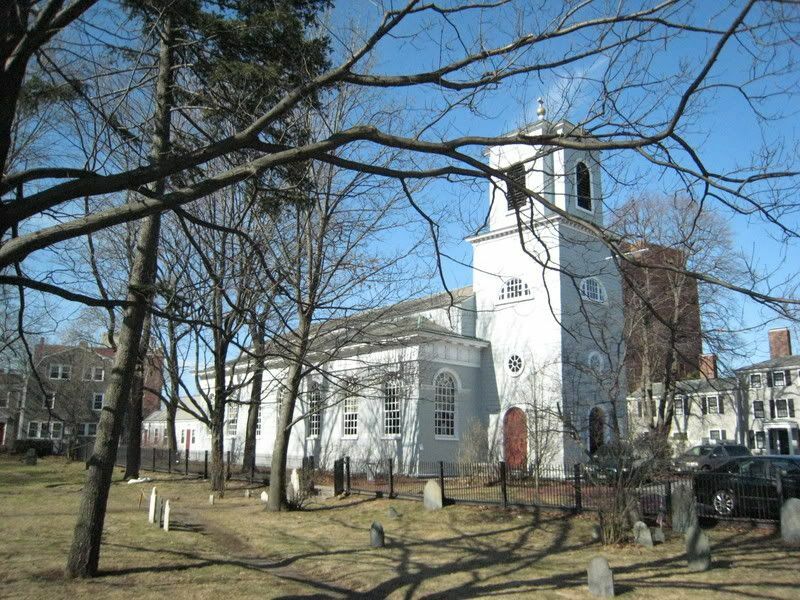 Work on the church started in 1759, supervised by it's first minister the Reverend East Apthorp. 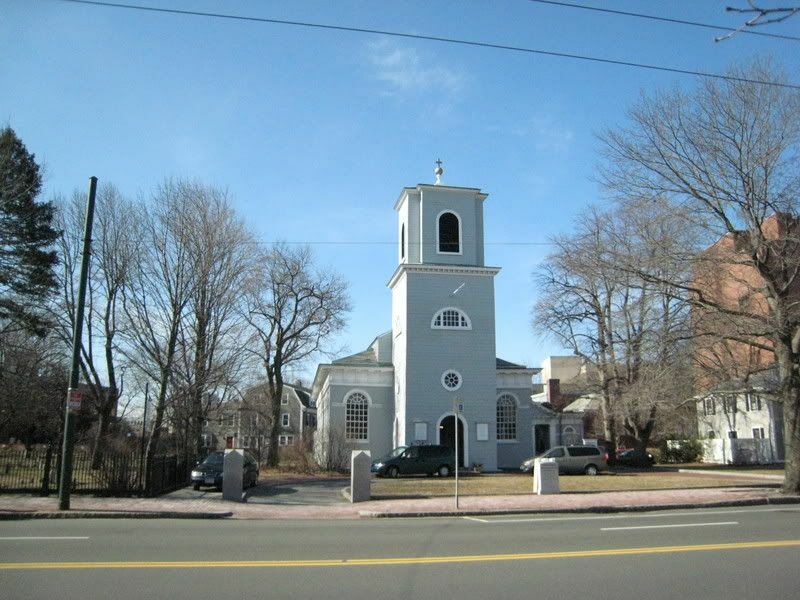 The church was designed by Peter Harrison, the architect who had designed the King's Chapel in Boston. Apthorp, his successor and much of the congregation were loyalists and many of them left Cambridge and fled further north or to England when the war broke out. 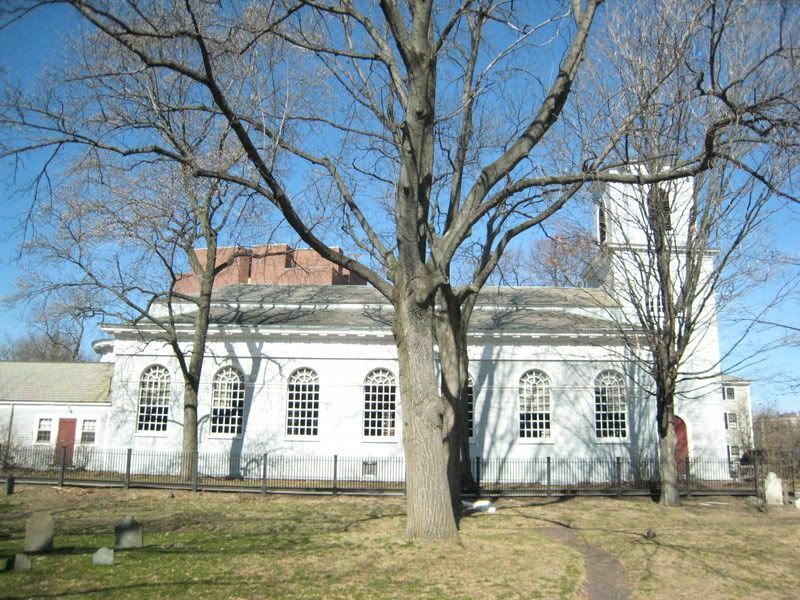 Continental soldiers were billeted in the church for a time and it is thought that the Washingtons attended service on New Year's Eve, 1775. 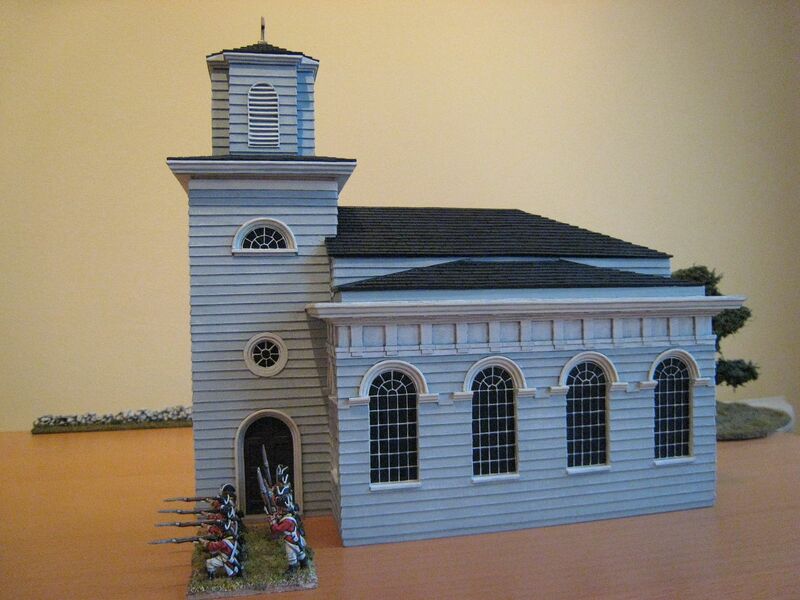 However, the church suffered from damage caused by patriots protesting against its former congregation's Tory leanings and its organ was melted down to make bullets. 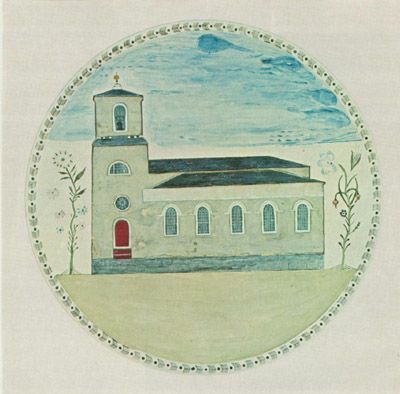 As a result, the church was closed until 1790 but it was eventually restored and in 1857 it was expanded to accommodate its increasing congregation. 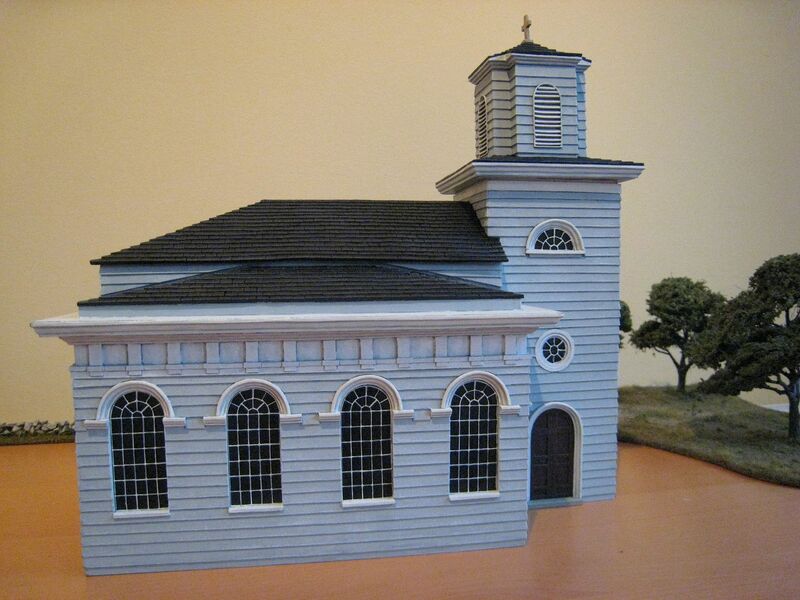 As a fully "in-scale" model, the church would have been huge; so it's been scaled down a bit and the length reduced to take account of the 1857 enlargement. The picture below, which I understand is a watercolour painted in 1793, shows 5 windows but we decided to reduce that to 4. The apse was also dispensed with, although I don't know when that was built and it could have been a later addition anyway. 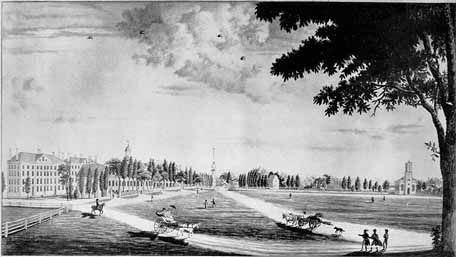 The print on the right shows Cambridge Common in the early 1800s. Here are a couple more photos of what it looks like today. 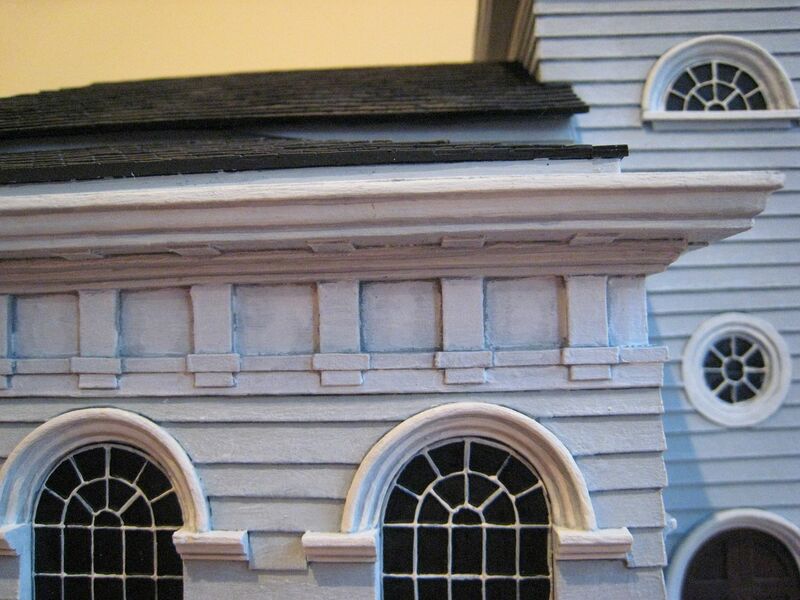 I took a number of close-up pics when I was there, so Tablescape had clear images of the architectural detail from which to work. The chaps at Tablescape put a lot of time and effort into this model, and I think it shows. 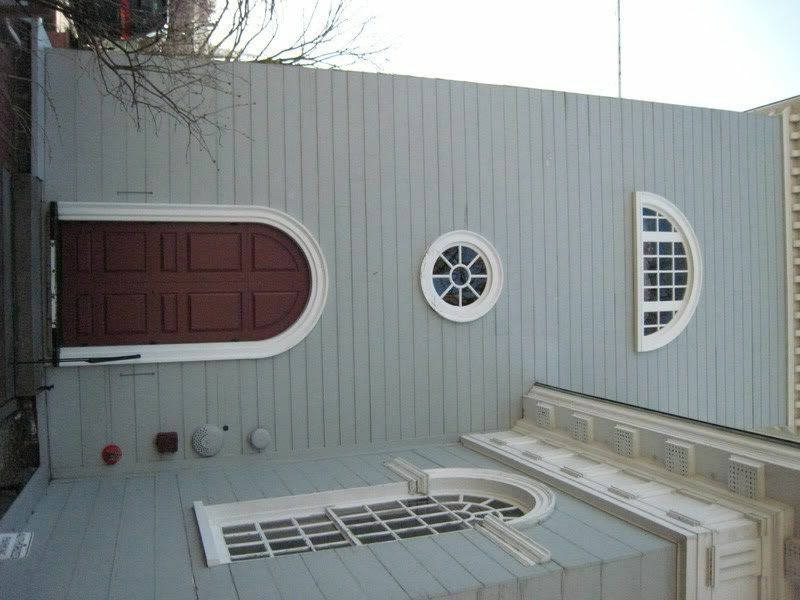 The frieze work around the top of the sides is particularly effective, I think. 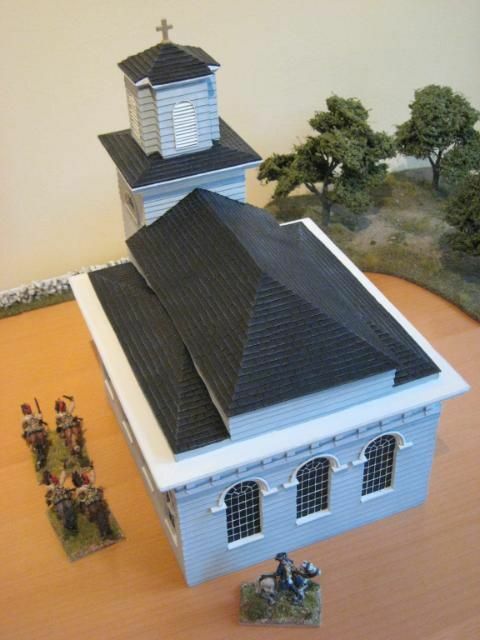 It's a large model, certainly considerably bigger than the Hovels church you tend to see, but hopefully not too large for the tabletop. The height of the tower is what makes it look big, but that couldn't be reduced any firther without the overall proportions being looking out of symmetry. I'd be interested in what readers think. 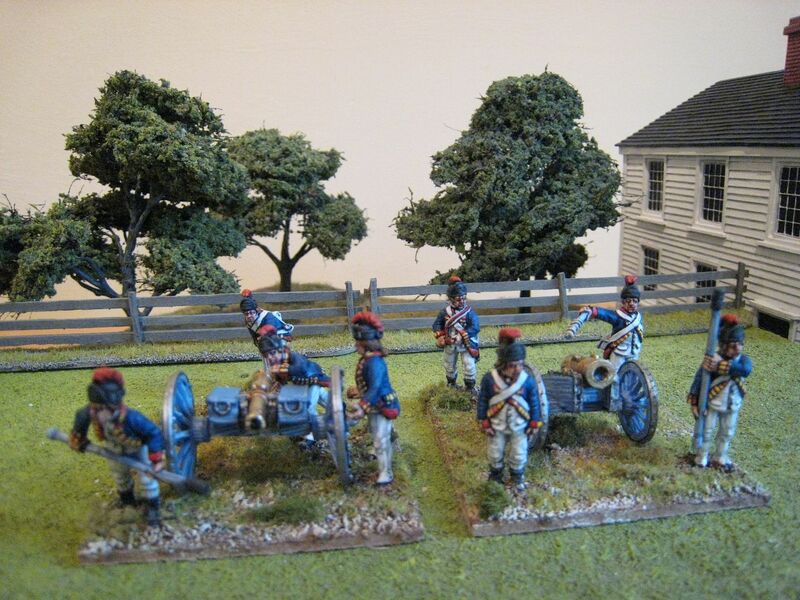 This is the first of two posts featuring British artillery for the 1777 Saratoga campaign. These Perry Miniatures figures show the crews in the modified uniforms that were worn on (and are unique to) this campaign - shortened coats, gaiter trousers and caps with red horsehair crests. I think it's correct to say that only Perry make Royal Artillery in this uniform. 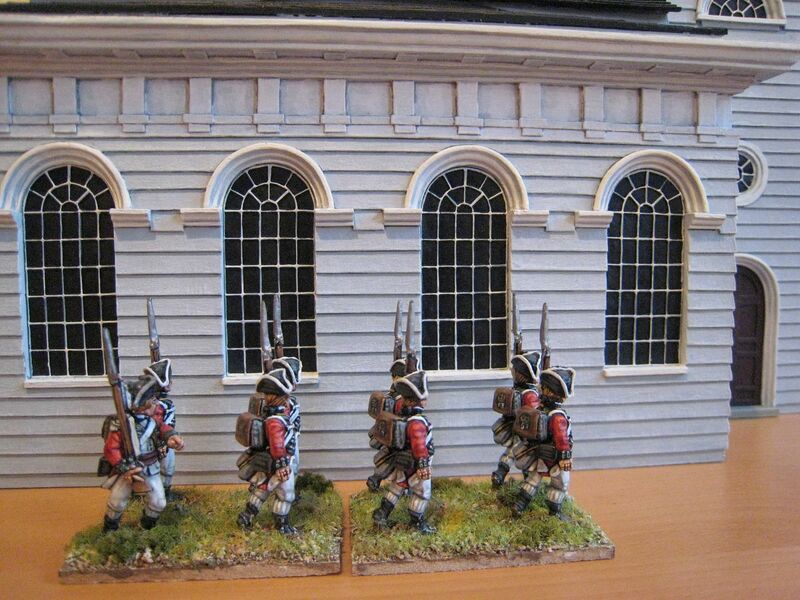 I have painted 3 of these sets and a small battery commander vignette which will feature in a second post. The 6-pounder you see here with the aiming crew is actually from Foundry; the pack's 6-pounder strayed to the 3rd crew I painted (whose own 3-pounder I lost somehow). The guns are painted in my usual British blue-grey palette, which I appreciate is more "blue" than "grey" but it's what all the other guns are painted with so I wanted to maintain consistency. The three colours used are GW "Shadow Grey", first highlight of Foundry "French Hussar Sky Blue 76B" (replacing GW "Hideous Blue" which has apparently been discountinued), then second highlight of GW "Space Wolves Grey". If I was starting from scratch I'd probably use Foundry's "British Gun Grey 108" palette. 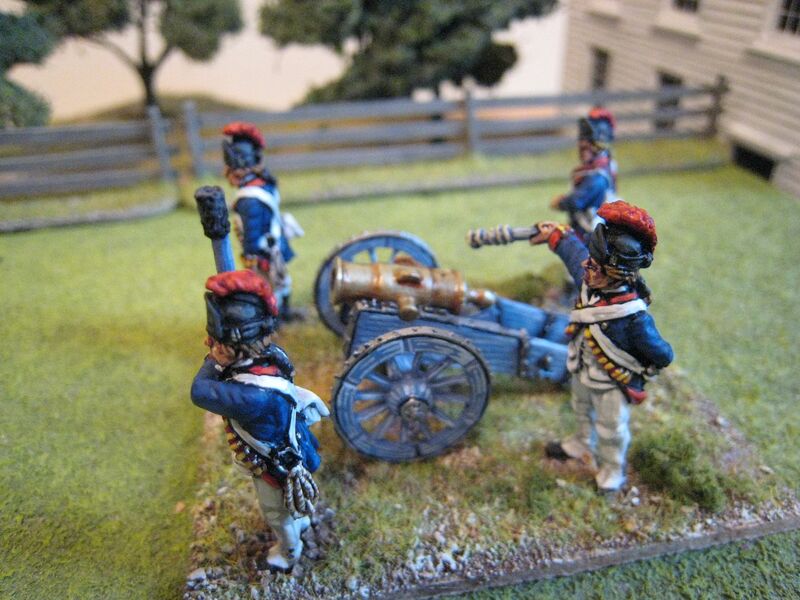 The gunners' coats were painted with Foundry "Deep Blue 20", my default dark blue for AWI figures. The Royal Artillery had a hard time of it during the Saratoga campaign. I'll elaborate on this in my second post. I appreciate that these photos are a bit rubbish. For the past couple of weeks the weather in London has been grey, miserable and very photo-unfriendly. If this year is like 2009 it will remain grey and miserable until next March...So I've had to rely on artificial, overhead lighting; hence the yellow glow. The good news is that I hve several posts' worth of stuff now, so blogging should be more regular in future. 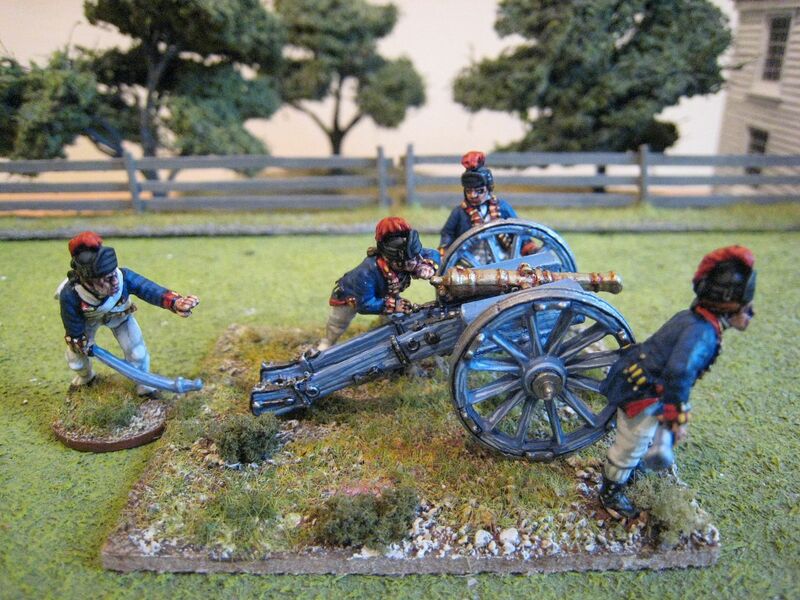 An advantage of painting artillery is that they are quick to do. I was surprised to see on checking this blog's archives that I last painted up some artillery over 3 years ago. I am making an effort to polish off all the artillery I might need for the British and Americans over the next couple of months (I don't require any more Hessian crews so that will only leave the French). With the completion of 3 Saratoga crews the British are now essentially finished - I suppose I could do with some larger guns perhaps, but will only buy and paint those when they are specifically required. Another couple of limbers might be useful, but again are not a priority. The British total is therefore 12 crews - 5 in "full dress", 2 in "northern campaign dress", 2 in "southern campaign dress" and 3 in the Saratoga uniform. I'm not particularly fussed about mixing these figures up; if I did Freeman's Farm, for example, which requires 6 guns on the British side, I'd use the 3 Saratoga crews and then 3 of the others. 8 figures and 2 guns. Painted November 2010. Albert Dominicus Trip van Zoudtlandt (1776-1835) joined the army of the Dutch Republic in 1791. He was originally posted to the infantry but at some stage he transferred to the cavalry. Upon his country's annexation by France in 1810, his regiment was incorporated into the French army as the 14th Cuirassiers. He saw action in Napoleon's invasion of Russia and then at Leipzig. He transferred back into Dutch service after Napoleon's abdication and in April 1815 was promoted to Major-General. He was then given command of a heavy cavalry brigade that consisted of the 1st and 3rd Dutch and 2nd Belgian carabinier regiments. His brigade was heavily engaged at both Quatre Bras and Waterloo. In the latter battle it successfully charged French cuirassiers with the Household Brigade. 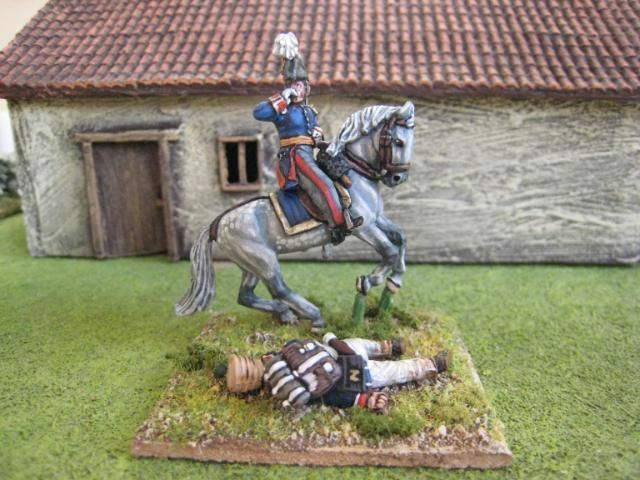 I painted this figure when working on Merlen's light cavalry brigade for Loughton Strike Force's Waterloo demo game of a few years back. 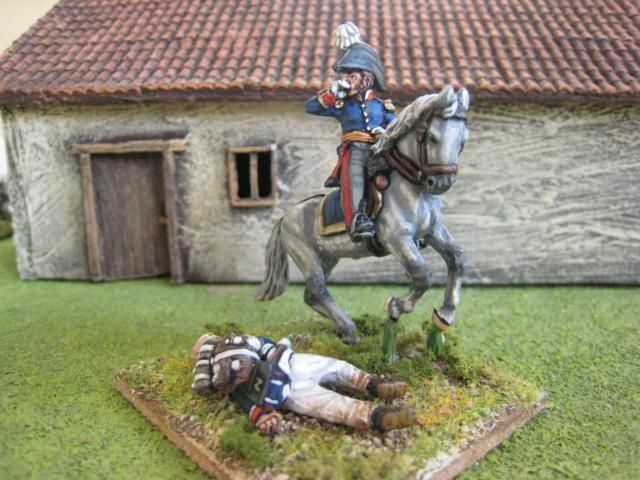 This Trip figure wasn't needed for the game and so lay painted but unbased until the other week, when I decided to touch it up and base him with a French casualty (from the Perry plastic heavy cavalry box). 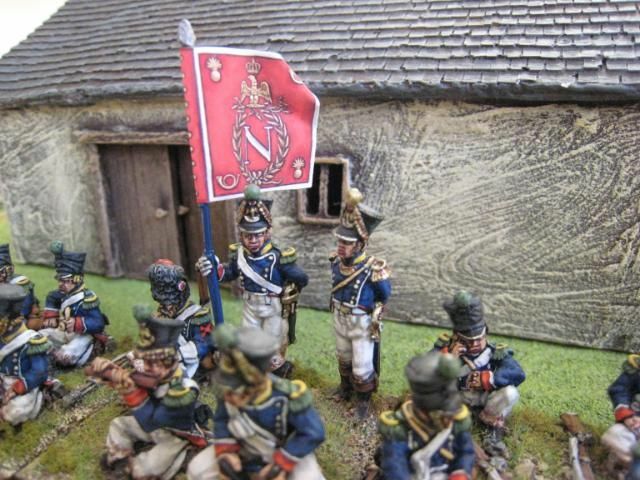 Also posted are photos of the Perry Young Guard 1st Voltiguers that I painted last year, but this time with their flag attached. As I said earlier, I will hopefully have some more posts soon. 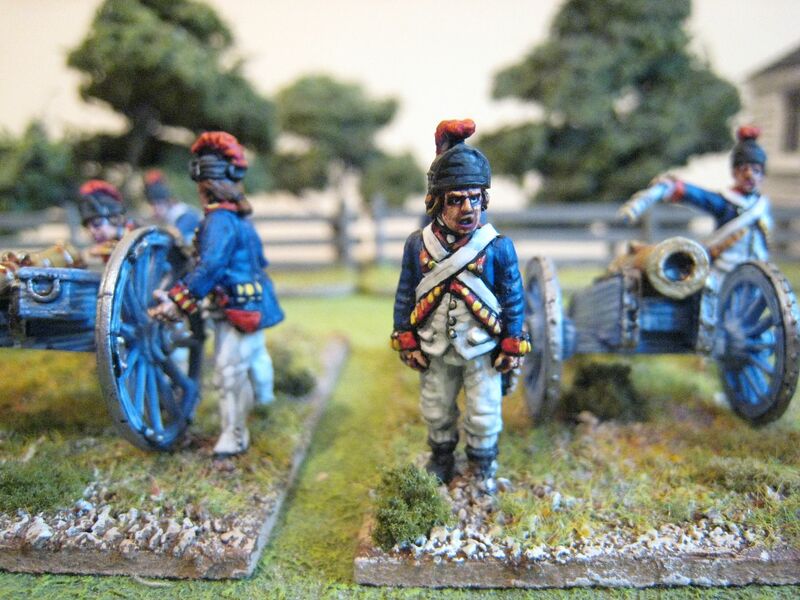 I am having a bit of an artillery thing at the moment - I have finished 3 guns and crews of British in their Saratoga uniforms and am about to start on some more American artillery. 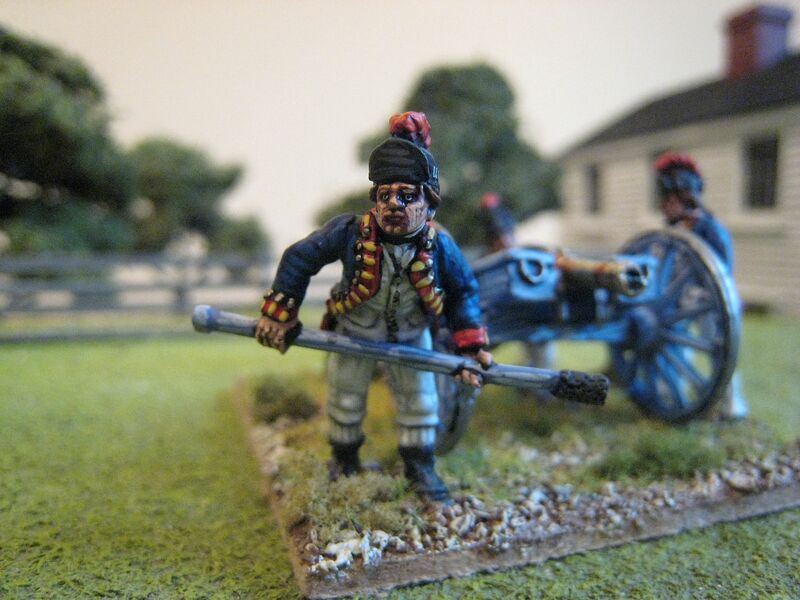 After than I might do some more Hessians or another American regiment. 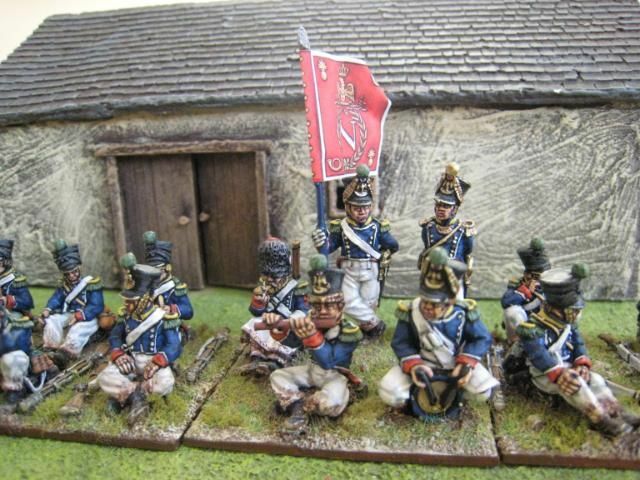 Incidentally, a reliable source has stated that Perry Miniatures will increase their prices in the New Year, to take account of not just the increase in the UK's VAT rate but also the rising cost of raw materials. 2 figures. Painted January 2007 and October 2010. Barns by Touching History. In the Waterloo campaign the 4th regiment of cuirassiers was brigaded with the 1st in the 13th Division in Milhaud's IV Cavalry Corps. The regiment mustered some 314 officers and men in 3 squadrons, under the command of Colonel Habert. At a ratio of 1:20 that equates to 16 figures. The regiment fought with distinction at Ligny and then was badly damaged during Ney's charges at Waterloo. Working my way through these figures was a pleasant, if time-consuming, experience. I found that my initial misgivings disappeared once I worked out that it is more satisfying to paint the horses and riders separately (this makes it much easier to do the detail around the riders' coat tails). The horses come in two halves so there are many different ways you can put the horses together; with the whole unit finished you can see the sense of motion and dynamism that can be achieved by this ability to mix 'n match. The rank and file have 3 different heads (2 with moustaches, the third clean-shaven). If you go for the "charging" right arm rather than the "at rest" one, you can therefore ensure that no two figures in a unit are exactly the same. Overall, I think the result is a unit of cavalry that captures the mid-charge look (whether the cuirassiers at Waterloo did actually advance any quicker than at a canter is another story). The figures are based on the green Renedra bases that come with the set (the edges painted with GW "Bestial Brown"): as I noted a few posts ago, the selection of bases is pretty limited, trying to cater for all basing combinations but not really covering any of them. However, for 16 figures the bases as provided do actually work - I used the four 3-figure bases and the two 2-figure ones. The Renedra bases are not as deep as my standard General de Brigade cavalry bases, so you need to exercise some care to ensure the two ranks don't collide with each other. There are a couple of "negatives" with these figures. You can see from the photos that the left hands end up quite a distance from the reins. I suppose this could be dealt with with some putty to create additional reins to reach the hands, but I doubt most people would want to bother with that. The joins of the 2 horse components sometimes leaves a bit of a gap around the neck - again, something that green-stuff etc could deal with and perhaps this is a more worthwhile exercise. More of a concern is that the mould lines often come right down the middle of the riders' heads, which makes them difficult to scrape out without damaging the facial detail. Now that they are all based, I've also noticed that some of the figures are quite wobbly - I don't know whether this is a result of using superglue or Citadel "polystyrene cement"; I used both and so have no idea which one doesn't work properly! My final gripe is that the standard as moulded onto the standard bearer is too small to accommodate a GMB flag - there isn't sufficient space between the fist and the eagle (this problem also arises with the plastic French infantry eagle-bearer figure). Adding a bit of metal rod to increase the flagpole's length was fiddly, but it seems secure enough now. But those niggles aside, I heartily recommend these figures. 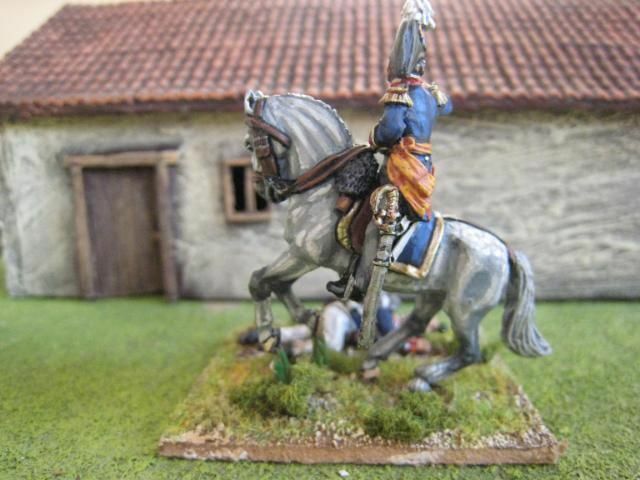 They provide the ease of painting that Perry plastics provide (probably all plastics, I expect) and I do like the variety of horses and rider poses. The inclusion of infantry casualties is a nice touch and the sprues generally seem carefully thought out. These figures substantially reduce the cost of building up reserve heavy cavalry divisions, but of course the other problems of storage and painting-time will remain. Anyway, I hope you like the pics. On the painting table: 55th and 57th Foot and Saratoga artillery for the AWI. 16 figures. Painted September/October 2010.